Interested in Spanish American War Uniforms? Want to buy a replica Spanish or American uniform? Our guide gives you the facts & information you want to know. This is a brief guide to soldiers and officers uniforms of the Spanish-American War, as with many ‘Western’ armies up until modern times, uniforms were not always strictly adhered to for various reasons including geographical origin of the soldier, local allegiances or simply a shortage of uniforms. The basic Spanish uniform during the Spanish-American War consisted of trousers and a shirt made from a white cloth, with blue pinstripes called ‘rayadillo’, there was no helmet, only a straw hat with a black band around it, each soldier was also issued with a raincoat and grey blanket and shoes or boots, made from black leather, while many were issued with basic sandals made of hemp. Officers in the cavalry during the Spanish American War, wore brown belting, combined with the red on the collar, and a long red Stripe down the trousers, Boots or leggings were made of brown leather. The horses were also dressed with brown leather and brass fittings with a saddle cloth colored depending upon service, the cavalrymens’ scabbards were made of silver and brass. 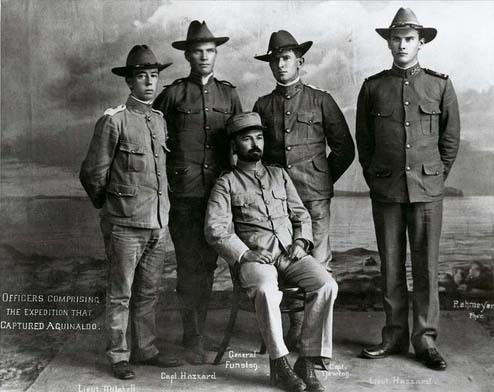 Officers on the other hand, were dressed in a very similar fashion to their men will something called a ‘gorget’; a small metal badge, this seems to have been intentional, to make the officers blend in with the men as no indication of rank was worn on the uniform during the Spanish American War. On the United States side during the Spanish-American War, the basic infantry uniform consisted of sky blue trousers with a white stripe and a dark blue shirt with white markings to indicate rank. The infantry man also wore brown pants, and on his head he would have worn what is known as a ‘slouch’ hat, which was creased at the front and back and was a light brown or possibly grey color. He would also carry long cartridge belts, as well as a white or grey blanket and haversack with a canteen for water. The cavalry uniforms of the United States in the Spanish-American War were changed almost immediately after the beginning of the conflict to something more recognizable to modern eyes, a khaki uniform, but even so, this was worn over a dark blue shirt, the chevrons on the uniform were yellow; the traditional color of the US cavalry. Large cartridge belts were also used extensively by cavalry men. Officers on the US side of the Spanish American War purchased their own uniforms in very varied styles, while often reminiscent of the basic soldier’s uniform, they were enhanced with the service color and somewhat over the top shoulder straps.